5 months since Russia granted asylum to Edward Snowden, the iconic image of the information-era dissident has been successfully used in various forms of art, media and merchandise. RIR offers a roundup of Snowden-related products in Russia and beyond. Less than a year ago, Edward Snowden was totally unknown. These days, however, people seem to be in a hurry to cash in on the NSA-leaker’s story, with books and films about him in the making and merchandise on sale. Snowden’s fame, which adds to the success of the products, received a boost when he became a temporary resident of Russia. After the documents he leaked have been made public, the US officials annulled Snowden’s passport. Then, Russian government granted him temporary asylum. Although the impact he made is worldwide, Snowden’s story is also a Russian one – and, duly, products and projects that exploit Snowden’s image started to appear in Russia as well as in the West. However absurd, Snowden’s name helps sell even the products that aren’t related to him or his story. A non-fiction book by Alexei Chelnokov titled ‘O Chem Ne Rasskazal Snowden’ (What Snowden Didn’t Tell) was published by Moscow-based Eksmo. Despite the title and the fact that the book features a portrait of Snowden on the cover, it has nothing to do with the former CIA contractor, using him rather as a news peg. Snowden-themed souvenirs are also available in Russia, although the demand is apparently limited. The online store Momo Shirts is offering T-shirts with a portrait of Snowden in the same style as a well-known red-and-blue Barak Obama poster, with the Russian word “molodets” (well done) spelled in Latin characters, at 999 rubles (about $30). A spokesman for the store told RIR that sales figures on individual kinds of T-shirts are not available. Similarly, he was unable to explain how the idea of a T-shirt featuring Snowden arrived, saying it probably came from one of scores or designers the store works with. A company called Vispo has a coffee mug with a black-and-white portrait of Snowden in its catalogue. However, 190-ruble (about $5.50) mugs don’t seem to be bestsellers. According to Vispo’s employee Alexander, when Snowden’s name made the headlines just over six months ago, someone ordered to custom-print several mugs with Snowden’s portrait. The company took it as a sign and included Snowden mugs into its catalogue. 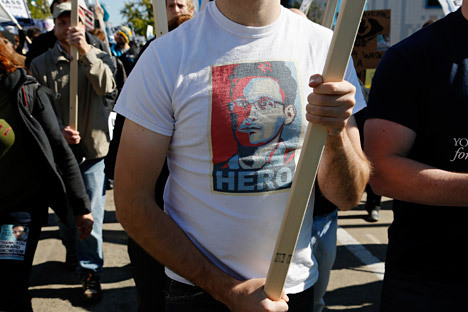 “But we haven’t sold more than 10 or 15 Snowden mugs all over these months,” Alexander said. Meanwhile, in other countries, Snowden-related projects are really happening on a much larger scale. Last August, Beijing-based electric car technology company Hong Yuan Lan Xiang said that it planned to register Snowden’s name as a brand for its new “secret technology,” which the company said was as groundbreaking as Snowden’s leaks. A month later, Snowden made a debut on the US cartoon series “South Park,” yet in a parody form. A character named Eric Cartman was apparently based on Snowden. Incidentally, the episode, "Let Go, Let Gov," brought the series’ ratings to a two-year high. Meanwhile, as soon as next September, “Classified: The Edward Snowden Story,” a dramatic thriller centered on the former NSA contractor’s story, is slated for release. The Canadian crew, including actor Kevin Zegers starring as Snowden, chose crowd funding as a way to finance the independent movie. Apparently, the filmmakers expect no financial gains from the project as they plan to release the movie online as a free download. The book industry could not overlook the Snowden phenomenon, either. Three books on Snowden are reportedly in the process of being written. 20th Century Fox, Sony Pictures Entertainment and cable TV network HBO are reported to have approached Greenwald abut film rights, but no deal has been struck yet. Meanwhile, Barton Gellman, a former Washington Post reporter is also reportedly working on books about Snowden.